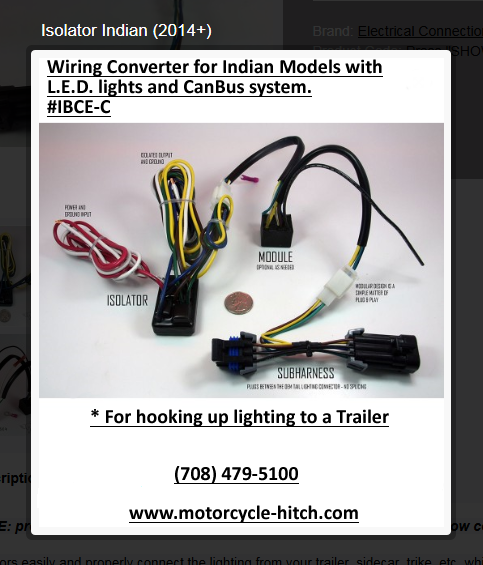 Click here for description: Just mention: Free Traffic light trigger in comments box when you purchase a Hitch. *Click Here to see Trailers to pull with your Indian! * Also fits: "Victory Models" and "Indian" Classic, Chief, Chieftain and Chief Roadmaster.... with CanBus Negative pulse to turn signals and L.E.D. Lighting. 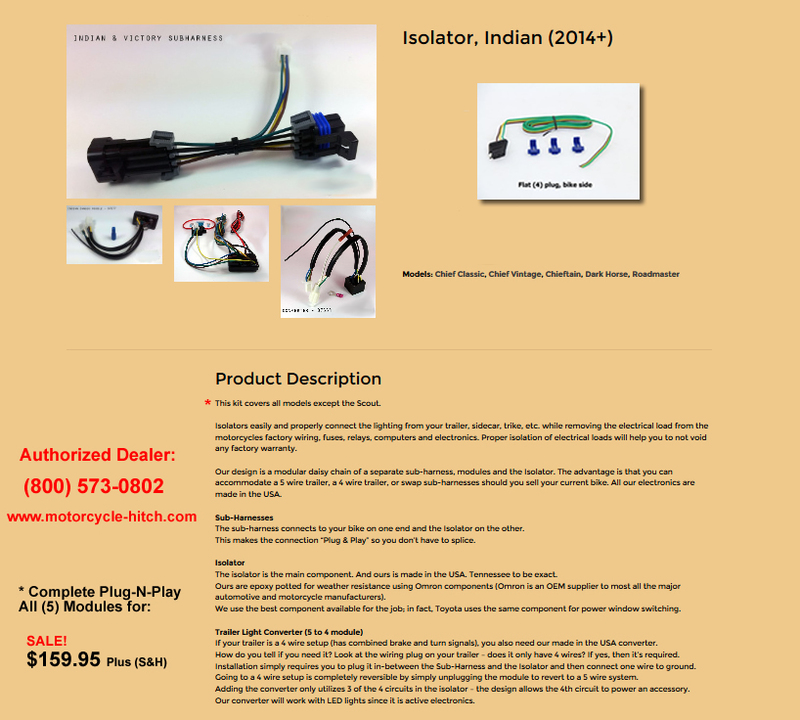 The turn signals on your motorcycle are controlled by the Body Control Module (BCM). The outputs are a constant hot with a pulsed ground. This is not the standard method. Our module takes the BCM wiring and creates output that can be easily used by our Isolator. Most importantly, it works in the background and is not detected by the bikes Canbus system and therefore does not create any service codes. This item is required for installation, if your bike has a Can Bus system. please call us at (708) 479-5100 one may be available now! We sell Den-Ray motorcycle hitches, they are the Canadian manufacturer leader in the industry of motorcycle trailer hitches and cargo trailers. We have developed over 200 models and have over 1000 hitches in stock ready to ship. Easy to install, our hitches are available in different styles, such as hidden, conventional, chrome fender, etc. Made in our factory, these hitches are developed directly on motorcycles. * Ask about our Special Package Pricing! Touch-up, Pints, Quarts & Kits! Our colors are matched to OEM paint codes & colors for restoring or repainting of damaged or replacement parts, fairing, tanks, fenders, etc. The Traffic Light Trigger makes motorcycles "visible" to traffic light sensors. Once the Traffic light's controller knows a motorcycle's there, the rider will get a green light, just like everyone in an automobile. Copyright © 2010 TMC e-Store . All Rights Reserved. * Low Price Guarantee: If within 15 days, you find a hitch & accessory package offered at a lower price we will, at our option, refund the difference!